With the recent increase in new jobs and clients gained over the past 6 or so months, photography sometimes seemed more like a task full of deadlines, emails, meetings and late nights of post-shoot work then previously. With all that combined together it was sometimes easy to get stressed and lose sight of why I am in the field in the first place...Because I love it! So the other day I jumped up from my work, grabbed a camera body, one lens and just hit the street for a few hours of exploring. Living in Atlanta, I've always enjoyed the art scene, city-scapes and what both local and international artists can contribute to the our city. First is an amazing piece by European street artist "ROA" located right in the center of downtown almost near the Georgia Dome. I'd been keeping an eye open for this one around the city for almost a year, so was very pleased when finally finding it. Second is another amazing piece by local ATL artist "Peter Ferrari" aka PLF. PLF is easily one of my favorites, with great work literally all over the city. Back to the bottom line of this post... which is to never forget just to have fun with it! I'm incredibly lucky to get to follow my passion and combine it into a career but balance is everything. 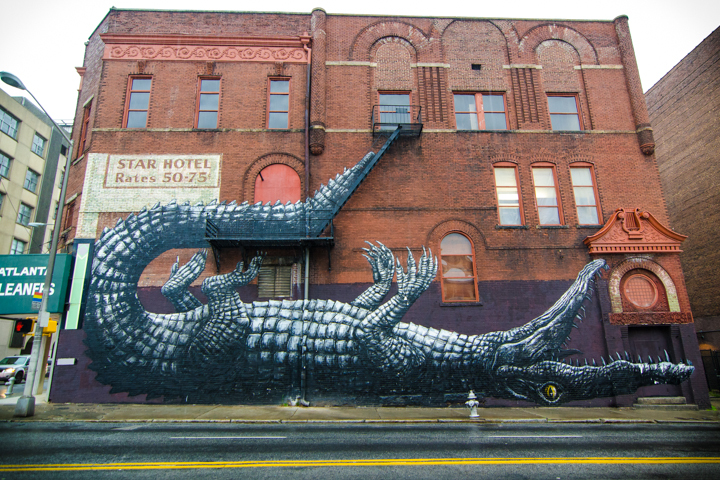 Now check out these amazing wall-mural pieces by ROA and PLF!